Botto, Antonio. “The Songs of Antonio Botto”, translated by Fernando Pessoa, Josiah Blackmore (Editor), , University of Minnesota Press, 2010. Recently I have been reading a lot of gay poetry but I must admit that I had never heard of Antonio Botte until I got this book. Sotto was from Portugal and lived an open gay life style in the early decades of the twentieth century. His poetry is sensual and candid and I think the beauty of his work is in the unapologetic attitude he had both about himself and his writing. That, in itself, is important when we consider that the very poems here were published in 1922, a time when being “out” could be understood to be a political action. We can guess what the public reaction was—he was ostracized and hated by many but he also received hands of support by those who cheered him on. I would go so far as to say that this collection serves as his memoirs. Reading them is akin to listening to a confession in all of its intimate details and eventually, even with all of the erotica present, he was accepted even though his sexual descriptions were condemned. It took 26 years to get a published English translation of the poems even though they had been translated some fifteen years before their appearance on the printed page. 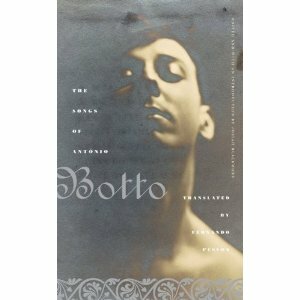 Eventually Botto achieved fame and many consider him to be an author who helped push the closet door open in terms of gay literature. I was amazed at erotica and the set and likewise the rhythm of the poems and lush language and style held me captive. The songs are divided into eight sections and they cover the gamut of gal life from young boys to elegies. Likewise he uses the gamut of emotions and we laugh and cry with him, we feel pain and we rejoice. Botto was a voice in the darkness who dared to tell the truth. Botto’s output was large—some twenty books of poetry, plays, stories and children’s literature. After Botto died in 1959, his writing seemed to hibernate and since he never really achieved the acclaim he deserved during his lifetime, it is now our turn to make sure that he is included in our cannon. In reading about Botto, the man, I learned that he worked as a civil servant but was fired in 1942 with the charge of “lacking moral character” whatever that means. He married so that there would not be stories of this kind circulating. Finally seven years he left Portugal and he and his wife relocated to Brazil where he died eleven years later when he was hit by a car. This v0lume assures Botto a place in gay literature and it is so good to have him there. This entry was posted on December 16, 2010, 1:02 pm and is filed under gay memoir and biography, Gay Poetry, GLBT Fiction. You can follow any responses to this entry through RSS 2.0. You can leave a response, or trackback from your own site.